Successfully Added Micro Wired Pinhole Color Audio Camera to your Shopping Cart. Micro Wired Pinhole Color Audio Camera. This color video and audio camera is designed for DIY (do it yourself) installation into the enclosure of your choosing. This small pinhole camera is 20mm x 20mm and needs no external light source, so it is perfect for uses where secure monitoring might be required. 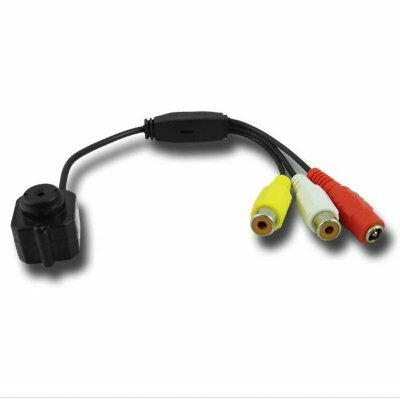 The video and audio feed are output to simple RCA jacks that can be plugged into your favorite recorder for viewing and storage. Cameras with audio capabilities are not permitted under the laws of some countries. Please check your local laws and customs regulations before ordering. China Vasion organize well except the delivery in time and custom duty at last which they not include. If they manage the delivery and reasonable custom duty problem then it is very good. The camera is very good for the money. You can connect it directly to your TV to see what's happening outside(for example) or to a DVR to record. It's small, so you can use it for your DIY projects. The people at Chinavasion were very professional in their services and the delivery was very fast: 5 days to Holland with DHL. I have the same question as Clive! i want to know exactlty What else is required for this camera to be fully functional? Also, set-up instructions! Thanks.